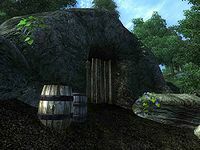 Yellow Tick Cave is a medium-sized cave between the Imperial City and Chorrol containing conjurers. It contains two zones: Yellow Tick Cave and Yellow Tick Hollows. 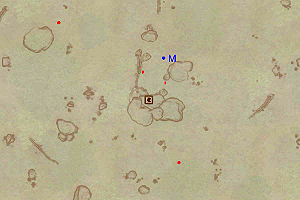 This location's map marker (M on map) is named Yellow Tick Cave (editor name YellowTickCaveMapMarker). The entrance door is SSW of the marker, 60 feet away. 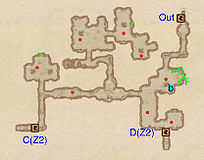 The first zone of Yellow Tick Cave is pretty much linear, with a few small passages branching off from the main one. 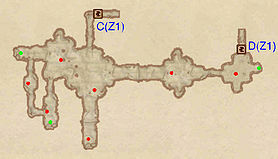 There are two doors (C and D) that lead to the next zone. 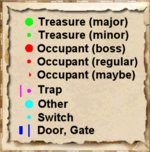 There is no major distinction between them, except for that door C leads nearly directly into the center of the enemies in that area, while door D takes a more inconspicious approach. Depending on which door you came in, you will either face one enemy or several at the same time. The two doors lead back to the first zone, but door D is nearer to the exit in the first zone.